Pic of the day: "Mr. Fox, I presume?" 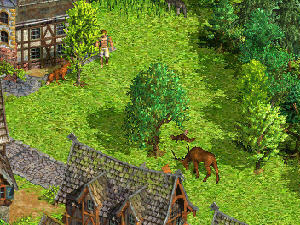 Screenshot from the game Anno 1503. The days are long gone when I used to buy a new computer game each month. These days, it is more like two a year, and a couple expansion packs. So it's a pretty big deal, that I have bought Anno 1503. Sadly. Even as I stood with the box in my hand (and not for the first time either, I have checked this out for a while) I heard the Lord say unto my soul: "You're wasting your money and your time as well. You have enough good computer games at home, and this one won't add anything you can't get from those you have." Now, I've never gone to PC gaming world for spiritual advice, and who amongst ye have ever seen the Lord playing video games? So, I supposed he was just cheap on me, and I bought the game anyway. Needless to say, the Lord knows what he is doing. Or perhaps it was my subconscious, in which case Lord knows what I am doing... Anyway, I wasted my money. And my time. Oh, it's not bad. Not at all. It is totally state of the art, with graphics so detailed you can watch the animals going about their pointless activities, anywhere on the immense map. The music is beautiful, so much so that I wish they had a soundtrack CD. I should have bought it instead of the game. Classic sound scores performed in a vaguely medieval way. The music is even context sensitive: It changes when you move into the territory of the native tribes, for instance, and even with the mood of your citizens. Oh, yes, the native tribes. A curious mix they are, from Inuits to Africans. There are 6 climate zones, from Arctic ice floes to desert and jungle. (Obviously you would not set up your own primary colony in the most extreme climates.) The natives are politically correct and won't try to expand on you, but they will be restless indeed if you start building too close to their village. In this they are rather similar to the Native Americans of Sid Meier's Colonization. Indeed, the whole game smells like Colonization meets Sim City. Sadly, it smells even more like Settlers III meets Settlers III. (That's Serf City to Americans, I believe.) I can't remember whether there was ever a Settlers IV, I just opened Settlers III long enough to verify that it was the same game with higher processor requirements. Well, this is the same game with insane processor requirements. Although it is not made by Bluebyte, I think ... at least the name of this German games company is different from the other German games company. Whether it's the same people, I don't know. I doubt it. The graphics have a different feel to them. The gameplay, however, has not. That said, if you don't have any real-time "explore and build and wage war" games, you could do a lot worse than this. If you have a brand new computer with a good graphics card. I ran it on an 1.7GHz Celeron with 512MB RAM and an nvidia geforce 3 Ti 200 graphics card. That was enough to run it without lag, but there were coffee breaks when loading a new game world or exiting an old. I'm talking about the kind of pause where you wonder whether you have to reboot your computer. Once you have the hardware, you will probably enjoy the detailed game world and the beautiful music. I wish there was a sandbox mode where you did not have to run against computer controlled opponents, then I might take the time to enjoy the sights and sounds, and feel pride and accomplishment as my citizens walk briskly from home to shop to home again, or go to church or school, while hunters go out to hunt, sheep go baah, and stonemasons go to work on slabs of stone. It is all beautifully animated, and if you spend enough time watching, your competitors will outgrow you and come over and kill your city. Mostly sunny and still fairly warm.